I went to Orlando this past week, and I will tell you about it. We flew to Orlando. I really love, plane trips, but this one was a little disappointing. The waiting wasn’t intense, and I had a ham and dijion mustard sandwich, so on the plane, it was better to wait until the flight was over than to stand in line for the bathroom…………. When we landed, my mom “lost” her glasses, but, they were really inbetween her seat and mine… yeah, it was 10:00 when we got to Country Inn, and but I did like our room because it was on the first floor. and we were off to SEAWORLD!! Well, I am not going to do this formally, but here is what I did in random order. So if you saw the website above, This topic is LAZY RIVER!! It is like an awesome pool that has a path and a current and wide enough to fit 2 floaties, and 2 seperate hottubs with waterfalls. After spending some time there, we all went back to the hotel for lunch. THEN….. The wizarding world of Harry potter! Well, it is in Islands of Adventure. When we went in, there were five islands, Dr. Seussland, the Lost Continent (Ride Posiden’s Fury!! ), The Wizarding world of Harry Potter, Super hero island, and Comic/Cartoon mainia! But you know where we’re headed! We started out Passing Zonko’s and Honey dukes, our destination was the Wizarding World of Harry Potter park! We finally reached that park. It looks just like what I saw in the Harry Potter movies! The first thing Me and Promethium did was go on the Forbidden Journey.The line was very very long, but it was worth the wait. It was a very cool rollercoaster ride inside the entire castle. Both my parents were not big fans of scary rides but they went on this one too. Mom said she actually was relaxed on the ride but had to close her eyes most of the time. It felt like you were flying along with Harry Potter. As he flew over the mountains in the sky, it felt real and it was scary. The end of the ride leads to a giftshop, Filch’s Emporium, and we got a slytherin tshirt ( for someone else,I personally am not a fan of Slytherin), Harry Potter mug, and a golden snitch pin. Then when we passed a butterbeer keg, I begged my mom for some. We each gat a cup, mom, dad, Promethium, and I. They got the cold kind.. I recommend the frozen kind. it is $4.69, One dollar more than the other kind. Frozen Butter Beer - yummy! We then found out that our giftshop items were missing. We looked under benches, asked around, but couldn’t find them. Later someone told us to go to the gift shop where we bought the stuff, see if anyone had found our sack and took to the store. But no, no one had taken our sack back to the store. However, the store clerks were extremely nice and felt sorry for our loss. They looked up their cash register to find our purchase transactions. Eventually they found our transactions, and they decided to give us the items we bought. Just like that, we got our stuff back. My mom was going to buy another t-shirt because it was for a friend of her work. What a kind and wonderful magic this was! The park literally covered our own loss! Well, after that, Me and Promethium rode the flight of the Hippogriff twice. It is not too exciting or scary, just simple, fun, and less than 20 seconds long. At Honeyduke’s, we – Promethium and I- got peppermint toads, sugar sticks, and a bag of assorted candies( expensive, but worth it!) , and at Zonko’s, Promethium got two pink pygmy puffs, one for her, and one for her friend. I got a purple pygmy puff named Tsi Tzi! Honey Dukes Candy Shop - awesome! Go to youtube.com and search Harry Potter theme park orlando Ollivander’s wand demonstration. It’s funny, and the person chosen gets to do the demo and gets a free wand. If you hav happen to see sand and water lying around, mix them together to make a sandball. If you are outside with a distracted friend, or in the woods and see a rabbit or bird, THROW IT AT THEM!! THE REACTION IS FUNNY! I watched tv all day and then three was when we had to leave for the airport. 6:10 was our departure. The flight back was like the flight forth, except I went to the bathroom this time. Boring…………..
1st place: Art-5 by Diamond. $10 cash prize. 2nd place: Art-1 by Aaron. $8 cash prize. 3rd place: Art-2, Art-3 and Art-4 by Felix and Diamond. They will share the $5 cash prize. 1st place: Poem-1 by Diamond & Poem-6 by Rainbow Moonstone. They will share the $10 cash prize. 2nd place: Poem-4 & Poem-3 by Crystal, Poem-2 & Poem-5 by Aqumarine. They will share the total of $13 cash prize. 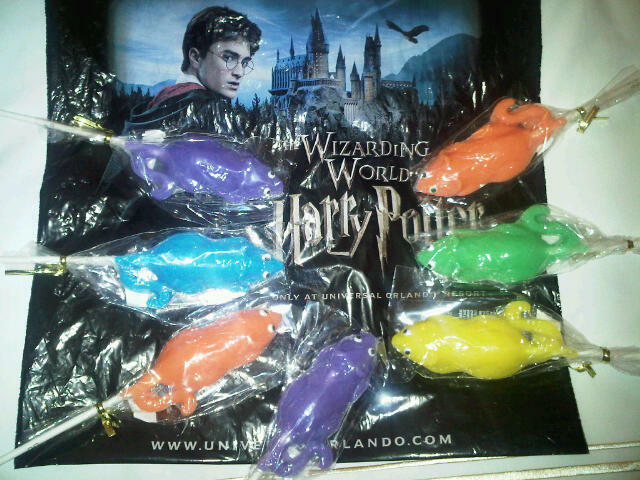 All participants will get a super cool Harry Potter Lizard Pops that I bought from The Wizarding World of Harry Potter. 4.They can totally be your alarm clock! Today we went to a park called Tian Tan. It’s really pretty. Along the way there are very pretty trees. Some-times there will be wild cats taking a stroll too. At the end there were two very cute little wild kittens on a tree. They were only about 6 inches long and 3 inches tall! One was white and one was black. If I could keep them as pets, I would name the white one Snowbell and the black one Moonlight. Today is my last day inBeijing. I’m going to Hunan Tomorrow at10:00in the afternoon. There won’t be any internet over there. I’ll make up for the rest of trip when I get back. Until then, see ya! Today is the best day ever! I got to climb the Great Wall of China! My mom and I went to the highest point. For some reason, I didn’t feel tired after the climb. The view is awesome at the top! You can look down and see the beautiful trees and friendly grass green mountains. The Great Wall looks like a gigantic dragon. Once I got to the top I started singing a song that I made up about me climbing the Great Wall. We got up early in the morning at 6:00. Now, you would think that after somebody climbs the Great Wall, they would go home and rest. Well, this girl doesn’t. After I climbed the Great Wall, I went to the place where they had the Olympics in 2008. I got a ring of all five fortune dolls. I also got a very pretty sunhat that’s all different colors. Today is the best day of this trip for sure! Art-5: More to my daddy – Happy Father’s Day! The Table of elements was started by Johann Dodereiner, a German chemist. He made the Law of Triads. The Law of Triads is when you add the atomic weight of elements that are similar and will add up to the third. This was the first try to group elements. In 1862, Alexandre Beguyer de Chancourtois, a French geologist, published the first table. The table had columns around the circumference of a cylinder. In 1863, John Newlands, an English chemist, published the table with elements in the order of increasing atomic weight but because he didn’t allow space for new elements it was criticized. In 1864, Lothar Meyer published a table that described how the elements were placed. He grouped them by their properties. This was the first time someone tried to group the elements by the properties. After five years, Dmitri Mendeleev challenged himself to rearrange the Table of Elements. He arranged them by the atomic weight and properties. He left several spaces for new elements. Later on in 1913, Henry Moseley used the X-ray and found that the wavelength of X-radiation of the element decreased with increasing atomic weight, because of the he assigned a new set of numbers to the elements. The new set of numbers is called atomic number. The atomic number is the number of protons or positive charges, contained in the atomic nucleus. There are also electrons which are the negative charge, it is the neutral atom. To find the number of electrons you have to take the atomic weight and subtract it from the atomic number. Now there are many different types of periodic tables such as the cylinder, spiral and much more! Just a little writing project I had to do at school. Poem-6: My dad is the…………………………. He is good at a lot of things. But you have to tell him what to do. My dad the math magician. Ask him any question he will answer it. He is slow and always late. You want him at 7:30, he comes at 7:50! My dad the quiet one. Unless he is very mad. My dad the helping hand. He is always their when you need help. My dad does not have a very long beard. My dad’s NEVER in a trance. My dad likes to wear shorts. My dad really likes to chase mice. This is Fan Fiction just so you know. Kendra sighed, closing Patton’s Journal of Secrets. She had been hoping to find something about bargaining with the Singing Sisters since Seth refused to say anything before he had been turned to stone, of course. Let me explain. Lately, things around Fablehaven have been absolutely hectic. A group of strange Shadow Beings are turning everyone to wood and stone. Agad was present right after Grandpa Sorenson was turned into a beautifully carved oak statue. The Shadow Beings (as Kendra called them because she didn’t know what they were) had snuck behind Agad and transformed him into granite. It seemed like those creatures were going crazy to prevent Kendra and Vanessa from helping the people who had been transformed. They even placed a curse on the Totem Wall! The only sources of information the Shadow Beings had not harmed were the Singing Sisters and the Fairy Queen. “We need to hatch a plan” Vanessa said “I don’t know how long the house will hold against these mystical Shadow Beings………..Hey! That’s it! We can ask the Fairy Queen for help. Maybe she can send Braken or some Astrids to help.” Kendra frowned.“I don’t know what Astrids can do against the Shadow Beings but since Braken is a unicorn he can probably help us. Only thing is that the Fairy Queen really needs him for the rebuilding. But I suppose it’s worth a try.” “Then let’s go!” Vanessa cheered. “All right Kendra, Vanessa and Raxtus. We have a pretty good team put together here but even so, we need to be alert at every moment. The Hall of Whispers will very likely be the hardest place we ever encountered. The entities in there will very likely radiate magical fear so I need all of you to drink this potion for me. Tanu made it for the Wymroost trip.” added Braken hastily. When everybody finished their potion, they mounted on Raxtus. “I would like to have Kendra keep her hand on me since there is such a long journey ahead of us.” muttered Raxtus. Kendra obeyed immediately. No sooner that two minutes in air Braken shouted over the wind ” Three griffins Raxtus! The one one the bottom is trying to cut of a dive. If you drop me right now can you catch me later?” “So you want to use the strategy Warren used before with the harpies right?” clarified Raxtus. ” Exactly! Vanessa hand me the sword now.” Vanessa gave Braken the sword and at that exact moment Raxtus let go of Braken. Braken whistled through the air while Kendra clutched her face so hard that you could see nail marks on her face. Suddenly, she heard a loud screech. Braken had hacked of a wing of one of the griffins and one of the griffins on top was zooming toward them at 75 miles per hour. Raxtus spiraled down and caught up with Braken right before the impact with the ground. Kendra sighed with reileif. “You okay Braken?” questioned Kendra with concern in her voice. “Good as new. In fact Raxtus should be setting us down at any moment now to intercept the griffens. He wants us safely out of harm’s way but I’m going to charge at that griffen that I sliced the wing off of. Got the plan? Right. Wait for it Raxtus……..wait…….and now! Drop us!” Raxtus dropped his passengers and swooped to engage in combat with his feathery opponents. The griffins dived and spiraled gracefully pecking Raxtus from behind. They were involved in this dangerous dance until Raxtus, faking to be ever so concentrated on one griffin swiped his tail and one griffin was out of the picture. Unfortunately, the battle one the ground wasn’t going that well. Bracken had knew from his two thousand years of experience that griffins have a hard time turning and when they do turn they turn jerkily like a puppet with half it’s strings cut. But this griffin was a different story, every move Bracken did was perfectly blocked like if this griffin had been prepared for combat. Bracken was tiring and the enemy was showing no signs of weakness. Then Kendra saw why. There was a wizard, a female wizard that was chanting empowering the griffins even more. She was standing on a high rock near a cliff. Kendra clenched her teeth. She was probably going to have to sacrifice herself in order for this to succeed. Lost in thoughts, Kendra jumped as a arrow whistled by her ear missing Kendra by a fraction of an inch. She had forgotten Vanessa was there to help her. “Vanessa!” shouted Kendra. Now it was Vanessa’s turn to jump. She turned and exclaimed”Kendra!” Kendra pointed at the cliff and Vanessa now saw the real problem. She unsheathed her sword and tossed her bow and arrow set to Kendra who caught it and slung it over her shoulder. Vanessa quickly motioned to Bracken and Raxtus who both understood now. Then Vanessa beckoned for Kendra to come with her. The crept along the edge of the cliff always staying hidden. Vanessa whispered “Shoot now!” To late. The sorceress turned her eyes widening and hesitating no more, she began another spell, a different one this time. As she chanted, the sorceress rose into the air encased to a golden sphere shimmering with magic the it popped into and blue glittering ball of power and the sorceress directed it to Vanessa and Kendra, her mouth twisting into a evil smile. “Run!” mouthed Vanessa” I’ll take care of this.” Instead of running, Kendra snuck behind the sorceress and threw her sword with deadly accuracy. But who knew the sorceress had the Sands of Sanctity? The sorceress laughed without humor. “I am Natacionda! You will never win a direct fight against me!” “You’re right! We will never win a fight against Natacionda! So Raxtus, leave the griffins and lets get out of ………………” Whack! Miss “I’m so magical” Natacionda threw the shimmering ball at Vanessa. Even so, Raxtus carried all the passengers out to sea including Natacionda. But Natacionda was a special case. Raxtus spiraled higher and higher and higher to make her dizzy so she couldn’t work any magic. Then, SPLASH! Raxtus dropped Natacionda while she wailed and cursed at everybody on Raxtus’s ride. “The key”Kendra remarked”must be some kind of round cylinder. But who has a guess on what it’s made of? We passed a pile of cylinders on the way here………..” Suddenly a inscription appeared-Either pass or die that will be determined on your first key try. “That means we try one key and we will either pass or die”Braken said. ” We will be looking for a key that’s silver like the roof .” Raxtus said from up above them. “Wait Raxtus.”Kendra said” we can’t find the key the normal way as most people have done it. They’ve probably looked in the key pile but that can’t be right because the key wouldn’t let itself be so easy to find. Take me up on that roof and we’ll split up and search.” Vanessa cleared her throat”Ummm, maybe I should do it in case there are dangers up there.” “Don’t fret Vanessa. Relax. Nothing can go wrong with Raxtus up there.” soothed Bracken. Raxtus picked Kendra up and flew up and started to laugh. “I am not your meek little friend Raxtus! I am the guardian of the key! I am able to take shape of the first animal that flies up here.” ” Raxtus is immobilized! The key is up here too.”shouted Kendra. She bit the duplicate of Raxtus with all her might. “Oweeee!” screeched the fake Raxtus. He dropped her right above the key. Kendra grabbed the key and threw it to Vanessa. Bracken caught the key and inserted into the key hole. A hole appeared in the roof where Kendra was. Before she fell into the hole though she saw that Raxtus was able to fly away as the monster crumbled to dust. Then as Kendra reached for the crumbling roof, darkness engulfed her. The foursome continued their journey into the Hall of Whispers. Kendra heard whispers coming from the stalls. She was scared, really scared. Suddenly, there was a wall in front of them. “Right this way.” said a monster with green and purple scales. It looked like an overgrown gecko. The gecko lead them to a obstacle course. It was filled with torture.” One of you must pass and get the key.” Announced a loud speaker overhead. “I’ll do it.” said Braken with determined look on his face “If anyone should die, it’s me. I’ve lived longer than any of you.” ‘No.” Vanessa cut in “You are a better fighter than I are. Everyone needs you.” “Stop it.” said Kendra “I can’t lose any one of you. Bracken, the time has come.” “What time?” asked Bracken looking confused. “The fairy king…….er, your father had gave me a mini statue of you. He said “When you need to sacrifice something, use this. Bracken knows the spell. Don’t worry. The statue isn’t alive. He has no brains, so you must be careful if your directions to him. Beware he can only be used once.” Kendra dramatically finished. “Yes. This is an old spell. I will perform it.” Bracken said solemnly. He took his horn and chanted “Eibuka samen ulaschentosa.” The statue turned alive and bowed to Bracken. “Go.” Bracken ordered “And get past the obstacle course, retrieve the key and hand it to me then slaying that green and purple reptilian right there.” Bracken pointed at the gecko. “Go to him to start the course.” “So you intend on doing it, eh?” cackled the gecko. “Let’s begin!” And so they started. First, the gecko ripped off the statue’s clothes and invited other monster’s to watch. Kendra gulped, closed her eyes and refused to watch that part. Then the statue was forced to run through what seemed like endless rows of thorny bush. When he was done, the statue was ripped up with an arm missing and was bleeding terribly. The monsters laughed and slapped their knees gleefully. The statue was then thrown into a large tub of boiling oil and was forced to listen to Opera music so loud the statue turned deaf. An slightly transparent box was materialized over him as soon as the statue got out. “This box will make every minute feel like a century to the person inside!” exclaimed the gecko. A lake appeared in the box and an apple tree hung beside him. ” He will never be allowed to eat! For 2 days!” roared the gecko. Inside the box, Kendra could see the statue getting thinner and thinner and thinner. “Now for one of the greatest horrors!” Announced the gecko. “Did he say “one of the greatest horrors” Kendra said sickly. She was feeling quite faint. The statue was tied to a pole, lashed twenty times with whip that had flames dancing around it. The gecko cast a spell of never ending life as long as he touched the pole. “This will make him want to kill himself.” the gecko grinned. An hawk swooped down and started biting off his heart bit by bit. Blood gushed everywhere. The statue cried in agony and pain. When the hawk finished the ever so slow process of eating the heart, the gecko spoke a healing spell and the statue was fine but he was defiantly greatly weakened. “Push this rock up the mountain and you get the key to the chamber of Windopolis!” shouted the gecko. The statue started pushing the rock up the mountainside. Just as he reached the top another rock rolled down. The statue kept on pushing. When he finally reached the top, all the rocks tumbled down the other side of the hill. “He got the key!” Kendra called in amazement and happiness. A faint smile played on the statue’s lips as he came down and handed Bracken the key triumphantly. “Oh no you are so not getting the key.” growled the gecko. The statue turned to face him. Today we went to the Capital Museum. It was very unique. My favorite part was the clothing. I like how the chinese people use animal designs for thier hats and shoes.My second favorite exhibit was the porcelin pots. Theyr’e so shiny and pretty! I noticed that the most common designs are dragons, lotis flower petals, and chrysanthamen flower petals. Here is one thing about this museum that I’ll never forget, my annoying little sister broke a lid from a teapot set that was 600 yuans and my mom had to pay for it! And my mom even told her not to touch it! Today is unforgetable! This trip to china is better than I thought it would be so far! Today this morning we went to a park called Tao Ran Ting. The park is a breath taking wonderland. Everywhere you look there is lush green grass, beautiful flowers, and trees filled with life. In addition, there is a great big pond ( or a small lake ) where you can go boating. My mom, my sister, and I road on a boat that goes automaticly. There’s a wheel so you can steer where you want to go. I was the driver. Being the driver is awesome! I finally figured out my 5th inner talent, steering a boat! Once, my mom let my sister steer. Once her hands were set on the wheel, we all went bumper boats! But then, we ran out off time so my mom let me steer us back. Yesterday was good too. That day was basicly a Mommy and I time. I spent the whole day with my mom outside playing. First we went to the Forbbiden City. That’s where the king lived. You can see where all the kings have their meetings, where they sleep, where they change their clothes, where they get married, where they die, and many more. I learned a ton about our history in the royalty subject. Did you know that the king controls the time, measurement, and time? Another thing that I think is cool is that the dots on the castle door ( or whatever that building is called ) means that the king is very powerful. I really like my trip to china so far. I wonder how the rest of my summer will be! I especially like the places way up high. And the fish I caught had a giant fin. If it’s Dirum, to me it’s a big prize winner! Opposite ends of the table, with the ball in flight. I’ll try to learn Ping-Pong too. So then, you won’t have to wear a hood. If most of my hits, not all, are bad! Then I’ll just practice on my own!